Giveaway Winners and New Pendants coming soon! I apologize for the delay in announcing the winners of the giveaway! Life and Pearl have gotten in the way and I've been trying desperately to get some sleep. I'm disappointed not to have gotten some more comments on the post, but the response I did get is very helpful in moving forward. Thanks to all of you. The good news for those who did comment is that you're ALL winners! How could I eliminate two of you?! About the pendants pictured here—I've spent way too much money at Michaels recently so that I can experiment with some new supplies and tools. I've had the wood burning idea in the back of my mind for a while because it's sort of become this cool, trendy technique (not like the traditional wildlife burnings we're familiar with). After the designs are quickly sketched on a one inch wood tile, I use a very fine tip wood burning tool and to "draw" the lines. 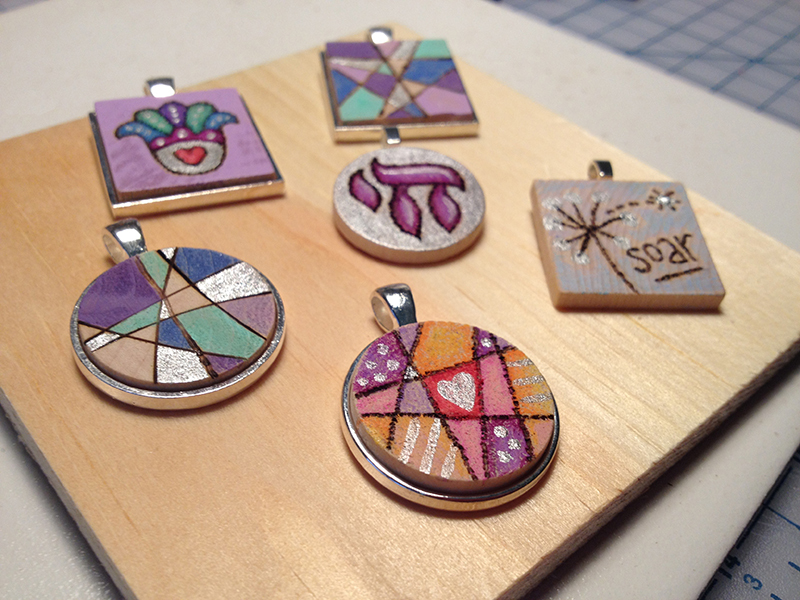 Then with acrylic paint or pencils the designs are colored and then have a bail attached or are set in a bezel. After some thought about pricing I'll make them available for sale in the shop, too. I look forward to hearing from the winners!